Cape Keri is a place on the island of Zakynthos mostly extended to the south. Most characteristic points are two rocks protruding from the sea and the lighthouse. Cape Keri is a cliff coast, so you can't get to the sea. You can only come to the edge of the cliff and enjoy the views. The best place to watch the characteristic rocks protruding from the water is a tavern located by the road leading to the lighthouse (about 500 meters before the lighthouse). 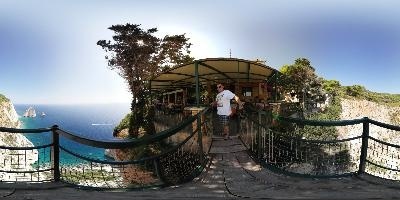 Tavern has an observation point - place 300-meters above the abyss secured by barriers. To make a photo from this viewpoint you must be a "tavern client", therefore you don't buy anything - you make no photos. It is posted in front of the tavern. However, the food at the tavern is good. Before a tavern in the driveway, there is a pole with a flag of Greece. It is the tallest flagpole in the whole of Greece. When passing the tavern, there is a free parking by the lighthouse on the cliff (the lighthouse itself can not be entered, it's behind a fence in a closed area - though it's just a small house - nothing special). The view from the cliff is nice but it's not the same as the one from the tavern.